At One Minute Cannabist, we firmly believe that the mind-body connection is critical to optimal health and well-being. That is why we promote and encourage regular mental and physical exercise in addition to cannabinoid therapies. We’re pleased to offer several programs that make it easy for you. Please wear loose, comfortable clothing, a positive attitude and an open mind. Everything else will be provided. Chair yoga is an all-inclusive, gentle practice in which postures are performed while seated and/or standing with the aid of a chair. From those just beginning in their yoga practice, to those experiencing limitations in mobility or flexibility, to those simply wishing to focus on a gentle practice, chair yoga supports people of all ages, abilities, strengths, or experience levels. 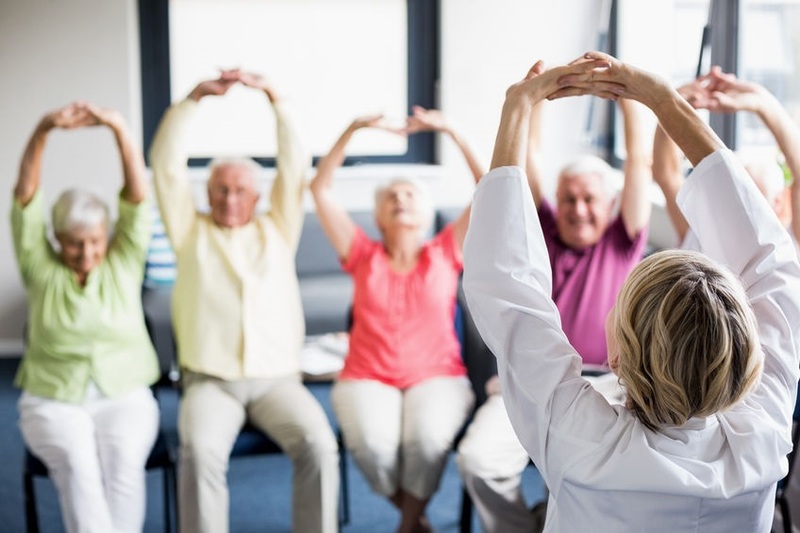 As in classic, floor-based yoga practice, chair yoga provides remarkable benefits of increased flexibility, circulation, balance, mobility, respiration, strength, and body awareness. Pranayama breathing techniques and centering to promote focus, mental clarity, and relaxation are incorporated into the practice of chair yoga. Come tune in to your body, mind, and heart, creating release, surrender and calm. Move from your thinking mind to a tranquil heart. Everyone. Whatever your age, fitness level or physical limitations, your overall health and wellness can be improved. You do not have to be able to touch your toes or contort into a pretzel to benefit from a yoga practice. You’ll be surprised how easy and fun it is. Leslee has been a Special Ed Teacher and Yoga Practitioner for close to 50 years. She has depended consistently on her yoga practice to aid her through personal and physical challenges, and to create playful and safe activities for her students and her own daughter’s early childhood development. Since completing her teaching certificate in Gentle Yoga, Leslee continues to experience and share the benefits of exploring breath and movement. Please wear loose, comfortable clothing, hydration, a positive attitude and an open mind. Everything else will be provided. Relax and enter a state of deep peace and healing, while allowing your intuition and psychic abilities to become stronger and more accurate than usual during this full moon phase. The crystal singing bowls are tuned to correspond to the chakras and are one of the most powerful chakra balancing tools available. Other instruments that you will hear, like chimes, bells and the sounds of ocean waves will take you further into your journey of healing. We want you to be comfortable and feel like you have snuggled up in your bed at home, so bring pads, bolsters, yoga mats, pillows, eye pillows and blankets or anything else that will help you relax and stay warm. Doors open at 6:30 pm (please arrive at this time for CBD) and the Sound Bath will start at 7:00 pm, as soon as everyone has settled down. Bring your crystals if you like – the vibrational sounds will clear and recharge them, just like they do for you! 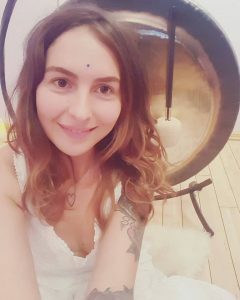 Danielle Kali Tyrrell lives in San Diego where she hosts sound baths and teaches Yoga. 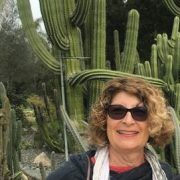 Since co-founding a CBD company with her husband, sound healing combined with CBD has quickly become her favorite way to create a healing space for others.